Data released this week remains consistent with the view that U.S. economy continues to expand at an above-trend pace. Although disappointing in terms of the headline, job gains were also consistent with an economy running near capacity. Furthermore, wage growth held at a healthy pace in November. An agreement between the U.S. and China to delay an escalation of tariffs until April failed to convince financial markets that trade tensions are easing. 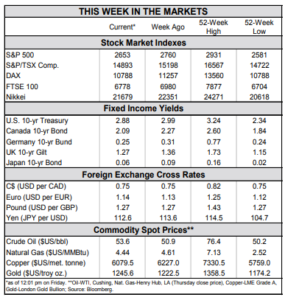 As an event-filled week in markets concludes, indicator data this week provided an updated reading on the health of the U.S. economy. 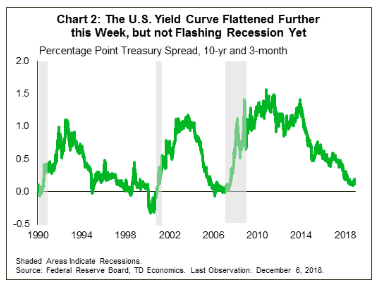 From the data released for the fourth quarter, the diagnosis is that the economic expansion continues in the U.S., with momentum slowing due to weakness in the external sector. Manufacturing and non-manufacturing activity picked up a bit in November, but is still off the highs recorded earlier this year. Firms continue to report capacity constraints, including labor and component shortages. Import tariffs remain a key concern. Similar worries were echoed in the Fed’s latest beige book report. Respondents to the Fed’s survey for the month of November indicated that labor shortages were being felt across a broad range of industries, and that tight labor markets were preventing them from getting the workers that they needed. In addition, rising costs, although offset in part by the falling price of oil, were impacting margins and leading firms to raise prices to offset them. Confirming these survey anecdotes of tight labor markets, this morning’s highly anticipated employment report saw 155k jobs added in November, below consensus estimates that expected an addition of 200k jobs. A steady labor force participation rate helped keep the unemployment rate at its cycle low of 3.7%. Wage growth remained healthy at 3.1% (year-on-year), the same as in October. 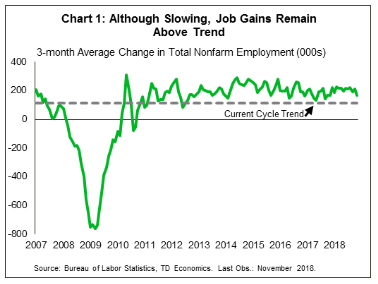 Although the headline disappointed, the broad slowdown in job gains is in fact consistent with an economy running near capacity. We estimate that long-run trend job growth is about 100k a month, plus or minus 20k or so (Chart 1). 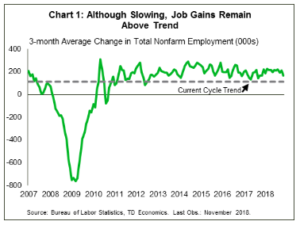 Therefore, job gains above this level are consistent with an expanding economy and the absorption of any remaining labor market slack. Strong fundamentals, however, are providing little comfort to financial markets. News headlines about slowing foreign demand growth, ongoing trade tensions, and Brexit have driven equity market volatility up, and prices down in the past couple of months. Fear lit a bid for bonds this week, with the U.S. 10-yr yield falling below 2.9% – its lowest level since early September. Although a flattening yield curve typically forebodes an increased chance of recession in the quarters ahead, there is little in the way of corroborating evidence (Chart 2). 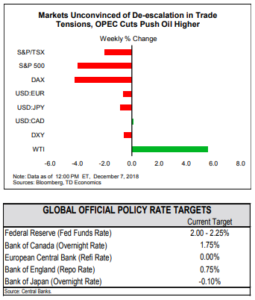 Instead, the recent move is likely a reflection of near-term concerns about temporary weakness in inflation and trade risks, rather than a deterioration in economic fundamentals. Undoubtedly, an easing of trade tensions would be a welcome development. The G20 summit proved somewhat constructive as it produced a 90-day break from an escalation in import tariffs between the U.S. and China. But, news of the arrest of Huawei’s CFO later in the week revealed how fraught the relationship is currently between the U.S. and China. Tariffs appear to be just the first step in planned engagement with China on a set of deeper issues that need to be addressed.